Cupping therapy has become the latest fad after the Rio Olympics. You may have noticed that many Olympic athletes, including swimmer Michael Phelps and US gymnast Alex Naddour, had some large purple circles on their backs, shoulders and arms. Those marks were the result of cupping. Cupping is a lot like the inverse of massage – rather than applying pressure to muscles, it uses gentle pressure to pull them upward. This provides the benefit of increased blood flow to the muscles. Cupping is a core part of Chinese Medicine and Acupuncture, a therapy that originated in China thousands of years ago. Essentially there are two types of cupping: dry and wet cupping. Dry cupping involves placing cups on the acupuncture points (with negative air pressure inside) on the skin to create a suction, which increases blood circulation, help relieve pain, remove “heat” and pull out the toxins that linger in your bodies tissues to the area where the cups are placed. This is the type of cupping therapy we practice at Core Elements. 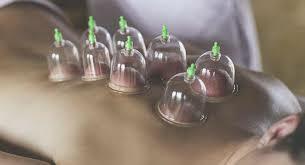 Wet cupping is a traditional Chinese Medicine therapy which is a type of controlled bloodletting by puncturing the skin and using the suction to draw out a small quantity of blood, which are believed to help remove harmful substances and toxins from the body. Neck and shoulder pain is a manifestation of the stretched myofascial tissues in the area. When cupping is performed, it lifts the skin from the myofascial network by creating a vacuum. As blood rushes to fill the empty space, it brings with it fresh nutrients and oxygen. This infusion works to heal the affected area by clearing away the knots and constrictions in the muscles. In addition to blood, the area also receives more lymph. Knots and stiffness can also be caused by a buildup of toxins, dead cells, and other debris. The lymph works to clear the toxins and cleanse it so that healing is further promoted. It’s non-invasive. Cupping is a gentle treatment that is relatively harm-free. So relaxing! Cupping is warming to the body. It feels like a deep tissue massage, and the effects are similar too. It stands the test of time. Although this treatment is trendy right now, its use in Chinese Medicine dates back to 281 A.D. It was even used in Ancient Egypt as far back as 1550 B.C! Cupping can treat a wide variety of conditions. Some of these include: muscle tension (especially in the back, shoulders, and legs), migraines, allergies, acne, eczema, indigestion, asthma, arthritis and fibromyalgia. It can benefit your mental health. This treatment not only works on your body, but your mind too. It can help to bring up trapped emotions, and has been known to help with anxiety and depression. Cupping works quickly! Like a massage, some of the benefits of cupping can be felt immediately during treatment and last for days. What are the Effects of Cupping? There are minimal side effects. Since cupping is such a gentle therapy, there are essentially no side effects. Cupping can cause the skin to temporarily turn red, blue or purple, especially if there is an injury or energetic blockage under the area cupped. This is due to the release of the bodies toxins. The skin discoloration can last anywhere from a few days to a couple of weeks, but is rarely painful. Once the marks have cleared, the procedure can be repeated until the condition or ailment is resolved. Avoid cupping if you are on a blood thinning medication or have a bleeding disorder. We have many trained therapists at Core Elements that practice Dry Cupping and incorporate it into their treatments. Call today to book an appointments for better health!